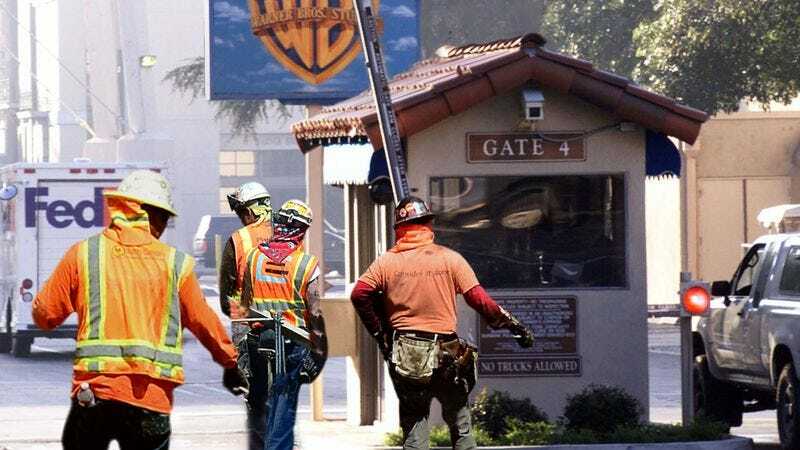 LOS ANGELES—Numerous Hollywood maintenance crews were reportedly dispatched early Thursday morning to fix a rash of plotholes that have developed across the film industry, with laborers called to fill in unresolved third acts and smooth over illogical character arcs at worksites on the Warner Bros., Universal Studios, and Paramount Pictures lots. “Every spring we get reports of big plotholes from nearly every studio, and we have to send out workers to repair these deep, troublesome inconsistencies in films before they cause too many problems,” said Hollywood’s Department of Cinematic Works commissioner Brad Barnett, who added that the plotholes tended to be worst just after the end of a long, arduous awards season. “Plotholes can form due to poor studio conditions, the presence of implausible events, or a prolonged lack of attention by screenwriters. And if they aren’t patched up by adding some solid dialogue or an additional explanatory scene, then the plotholes will continue to grow and we’ll need to send in a specialized crew to tear up the script and do a complete overhaul on the underlying storyline. Not only are plotholes annoying for moviegoers, but if you run into enough of them, they can totally destroy your suspension of disbelief.” Emphasizing that regular maintenance was critical, Barnett said that he expected viewing conditions to improve significantly before the summer blockbuster season, when the number of plotholes is expected to quadruple.